This free to play MMO real time strategy has players efficiently managing their assets, resources and time trying to establish a military base, defend it with militarised units whilst fighting off attackers and trying to form diplomatic relations with other players. Soldiers Inc tests the management skills of players as they try to rise to the top of the game rankings to earn rewards and prestige by competing against others to not only improve their own base but to destroy their enemies. Soldiers Inc is primarily a very social MMO, accessible through the likes of Facebook, it puts players against each other in competitive gameplay but also encourages cooperative play in the forms of alliances or “Combines” as the game call that were players can work together on similar goals. Any player that is registered to the game has low-level player protection where they cannot be attacked (unless they attack another base first or both players initiate and accept a conflict with each other in) for the first three days of gameplay. Once this time is exceeded it becomes open season on the player and anyone can attack them of any level and so players are encouraged to join a Combine to gain protection against more aggressive players as well is support in other ways. However in joining one of these alliances you also take on their enemies and heated wars and rivalries between different competing Combines is common. Combat within the game and typically takes place in the form of raids where players can try to attack rival base, sending their offensive units up against rivals defensive units and structures. Players have a cap of 10 raids that they can perform and get resources from, with this value replenishing 1 attempt every two and a half hours. Players are able to Raid beyond this 10 cap, but gain no resources from the attempt and may simply be used to further destroy an enemy’s defences. Units and some buildings have an offensive and defensive value for combat, when combat is initiated it is these combined values that will determine who is the victor in a fight. Offensive units are typically only good in a Raid, and defensive units and buildings for defending the players own base, an attacking player must fight past all their targets defending units before they can begin to pillage the base for resources. 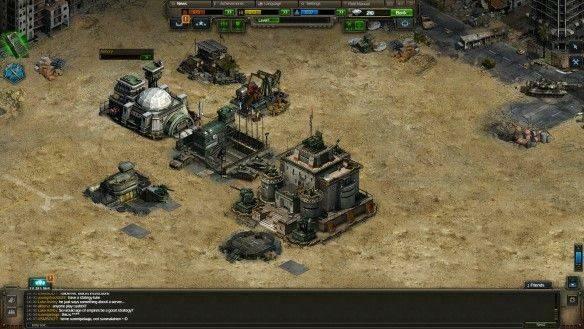 In the base a players defensive units are boosted by the number and types of defensive buildings that have been constructed, so the player must manage their resources and time well to decide which order they should build defensive buildings, defensive units and resource production buildings. Resource management is an important aspect of the game, with three main resources to keep track of: Rations, Fuel and Munitions; Fuel and Munitions used to stock up your units weaponry and help build up new buildings where Rations are used to maintain your units, using Rations every hour a good commander will make sure his troops are well fed so that they don’t begin to go AWOL. Commanders are also able to upgrade their various buildings as new technologies are recovered from the different NPC groups within the game. Soldiers Inc is a free to play MMO but offers a premium resource in the form of Diamonds, which can be spent to speed up different actions such as constructing units and buildings and generally cut down the more time-consuming processes in the game. Players can also use them to purchase contract referrals, resources and other units on the black market or add special defensive improvements to the base structures. Diamonds can be earned in some degree by simply playing the game (playing five consecutive days), completing in game actions or by coming out on top in the weekly rankings.